Rationale: Repeated exposure to several drugs of abuse has been reported to induce behavioural sensitization. So far no evidence has been provided that such a phenomenon also applies to cannabinoids. Objectives: In this study we investigated if repeated exposure to Δ9-tetrahydrocannabinol (Δ9-THC) induces behavioural sensitization. In addition we tested the possibility of cross-sensitization between Δ9-THC and morphine. Methods: Male Sprague-Dawley rats were administered for 3 days, twice daily, with increasing doses of Δ9-tetrahydrocannabinol (2, 4 and 8 mg/kg i.p.) or increasing doses of morphine (10, 20 and 40 mg/kg s.c.) or vehicle. After a washout of 14 days the animals were challenged with Δ9-THC (75 and 150 µg/kg i.v. ), with a synthetic cannabinoid agonist WIN55212–2 (75 and 150 µg/kg i.v.) or with morphine (0.5 mg/kg i.v. ), through a catheter inserted into the left femoral vein 24 h before, and the behaviour recorded. Results: Rats previously administered with Δ9-THC showed a greater behavioural activation compared to controls in response to challenge with Δ9-THC (150 µg/kg i.v.) and to challenge with morphine (0.5 mg/kg i.v.). Similar to that observed after repeated opiates, this behavioural sensitization was characterized by stereotyped activity. Animals administered with a schedule of morphine that induces behavioural sensitization to morphine also showed a behavioural sensitization to challenge with cannabinoids (Δ9-THC and WIN55212–2, 75 and 150 µg/kg i.v.). The effect of the challenge with Δ9-THC was prevented by the administration of the CB1 antagonist SR141716A (1 mg/kg i.p. ), 40 min beforehand. 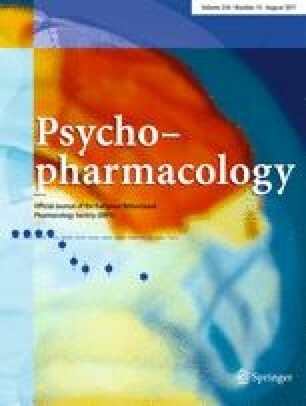 Conclusions: The results of the present study demonstrate that repeated exposure to Δ9-THC induces behavioural sensitization not only to cannabinoids but also to opiates. This cross-sensitization was symmetrical since rats behaviourally sensitized to morphine were also sensitized to cannabinoids. These observations further support the evidence of an interaction between the opioid and the cannabinoid system and might provide a neurobiological basis for a relationship between cannabis use and opiate abuse.